The Eysenck Personality Profiler (EPP) was developed by Professor Hans Eysenck and Dr Glenn Wilson. It is widely used in research, for clinical purposes and in consultancy. In business, it is used as a selection and appraisal tool. 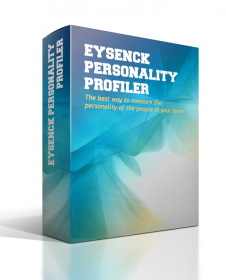 The Eysenck Personality Profiler (EPP) measures 21 traits of personality that are consistent with the three major dimensions of personality as defined by Professor Hans Eysenck. A Lie Scale is also included. The scales are available separately or as one questionnaire to suitably qualified people. A short version of the EPP is also available. For a list of most academic EPP references, see here. Do note that there are many other references in the literature about the EPP.